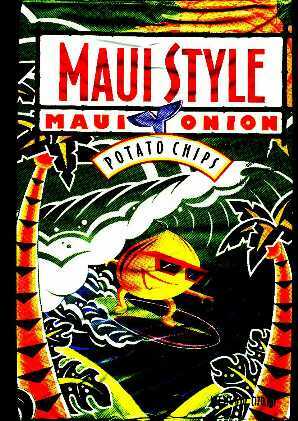 Frito-Lay Maui Style Potato Chips. Howzit, potato chip freaks! Have you ever wondered why Maui Onions taste so unreal? It's because they're so happy! I mean, where else can an onion wake up every morning, grab his board, padddle out into the crystal blue, and clock some major tube time in the most awesome wave on the planet? Oh, like Kansas maybe? Yeah, right...as if! There's NO place as classic as MAUI. Except maybe Bali, but I don't think Indonesian onions can surf. Manufactured in Hawaii by Frito-Lay, Inc.
GUARANTEED FRESH, till the date printed on the package. Corn, Cottonseed, Sunflower, or Hydrogenated [Corn, Cottonseed, or Sunflower] Oil), Dextrose, Onion, Salt, Maltodextrin, Monosodium Glutamate, Modified Corn Starch, Malic Acid, Gum Arabic, Garlic, Maui Onion, Natural Flavors, Hydrolyzed (Corn Gluten, Soy, and Wheat Gluten) Proteins, and Caramel Color. Serving = Size 1 oz. (28g/About 14 Chips) 6 servings per package. Fat 9, Carbohydrate 4, Protein 4. Graphic and Text is copyright © 1998 by Frito-Lay, Inc.